The name Pontius Pilate provides two valuable clues to his background and ancestry. The family name, Pontius was that of a prominent clan among the Samnites, hill cousins of the Latin Romans. They had almost conquered Rome in several fierce wars. The Pontii were of noble blood, but when Rome finally absorbed the Samnites, their aristocracy was demoted to the Roman equestrian or middle-class order, rather than the higher senatorial order. It is Pilate’s personal name Pilatus that proves almost conclusively that he was of Samnite origin. Pilatus means “armed-with-a-javelin.” The pilum or javelin was six feet long, half wooden and half pointed iron shaft, which the Samnite mountaineers hurled at their enemies with devastating results. It’s hardened iron tip could pierce shields and body armor. The Romans quickly copied it, and it was this pilum in fact, during the Late Republican period that made the Roman Empire possible. 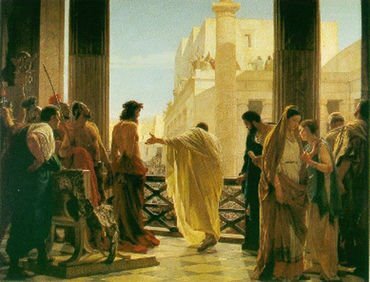 By the way, the picture above is called Ecce Homo, “Behold the Man.” It depicts Pilate gesturing to Jesus in the gospel narrative from the Latin Vulgate translation of John 19:5 and is by Italian painter Antonio Ciseri. It hangs in the Pitti Palace in Florence, Italy where I saw it there on an Easter Day many years ago. We know of Pilate in the Bible from the four New Testament Gospels, the Acts of the Apostles, and First Timothy. He is described in several later apocryphal writings. Roman historian Tacitus talks about Pilate, as well as Jewish writers Philo of Alexandria, and Josephus. Some historians feel that Pilate rose to prominence and perhaps gained the governorship of Judea under the sponsorship of Sejanus. 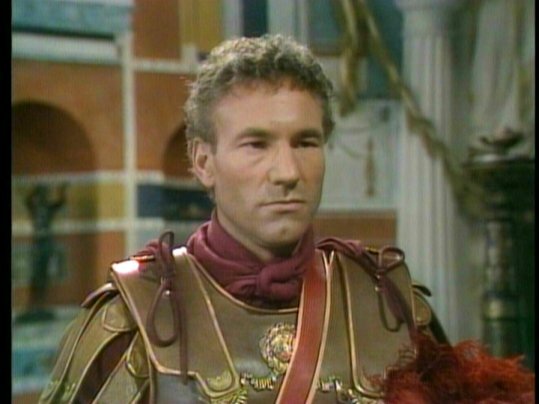 Some may recall that name from the BBC television rendition of “I, Claudius,” where the role was played by Star Trek’s Patrick Stewart. In Imperial Rome, Lucius Aelius Sejanus was, like Pilate, of the equestrian order. He was the prefect, or head of the Praetorian Guard, the personal bodyguard of the emperor. Sejanus was an ambitious man. 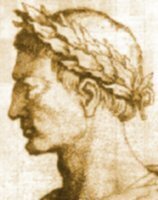 He had the complete trust of Emperor Tiberius, who at this time was living in self-exile on the island of Capri while engaging in various debaucheries. It is quite likely that at this time Pilate was admitted to the inner circle of “amici Caesaris” or friends of Caesar, an elite fraternity of imperial advisers open only to senators or equestrians high in imperial service. This fact would play a part in the later trial against Jesus. The emperor was getting old and paranoid. Sejanus took advantage of this and offered up to Caesar the names of senators he claimed were not loyal to Rome. Tiberius would convict them of maiestas, or treason. Their property and wealth were forfeit, and they usually committed suicide to avoid bringing public shame upon their name and family. Sejanus hoped to consolidate his power as well as advance himself in the confidence of the emperor, hoping perhaps to become co-consul with Tiberius. However his boldness did not go unnoticed, and through the efforts of the future emperors Caligula and Claudius, the plots of Sejanus were made known to the emperor, and Sejanus himself was convicted of maiestas. His allies and appointees as well became suspect. It is unlikely that Pilate was an incompetent official, for he ruled Judea for a decade from A.D. 26 to 36. It is doubtful that Emperor Tiberius, who insisted on good principal administration, would have retained Pilate for so long, the second longest tenure of any first-century Roman governor in Palestine. Nevertheless, the governorship of Judea was a most taxing experience and, aside from Good Friday, it seems from our sources Philo and Josephus that there were a number of other incidents in which Pilate blundered. In what came to be called “the affair of the Roman standards,” Pilate’s troops once marched into Jerusalem carrying medallions with the emperor’s image or bust among their regimental standards. This provoked a five-day demonstration by the Jews at the Provincial capital, Caesarea, which protested these effigies as a violation of Jewish law concerning engraved images. Though Pilate had his soldiers threaten them with death, he finally relented and ordered the offensive standards removed. Later, he built an aqueduct from cisterns near Bethlehem to improve Jerusalem’s water supply but paid for it with funds from the Temple treasury. Josephus records that this sparked another riot, which was put down only after bloodshed by Roman auxiliaries, despite Pilate having cautioned his troops against using excessive force. On another occasion, Pilate set up several golden shields in his Jerusalem residence that, unlike the standards, bore no images, only a bare inscription of dedication to Tiberius. Nevertheless, the citizens protested, but this time Pilate refused to remove them. The Jews, with the help of Herod Antipas, formally protested to Tiberius. In a very testy letter, Philo reported that the emperor ordered Pilate to transfer the shields to a temple in Caesarea and rebuked him “for his audacious violation of precedent” concerning his Jewish subjects. This last episode occurred just five months before Good Friday. Tiberius had his eye on Pilate. Maier seems to imply that the standards were set up in the Herodian Palace. What evidence is there that Pilate did business from that Palace and not the Antonia? Great question. Before I answer directly, a little history. The Antonia, which I’ve visited in Jerusalem, has a long history before it was Pilate’s administrative HQ in the 1st century. Immediately adjacent to the Temple precinct it was originally built — according to Josephus — by John Hyrcanus for storing the priestly vestments that were used at the Temple. During Pilate’s time, it was used as a military barracks. Despite the fact that some modern archeologists contest this location, the legend goes that back in the 4th century Constantine the Great’s mother, St. Helena had these stairs transported to Rome to the Lateran Palace. The Scala Sancta (Sacred Stairs) are now situated across the street from the Basilica of St. John Lateran (San Giovanni’s) in Rome. It has been a pilgrim destination for centuries and even Martin Luther visited it in the 16th century. By the way St. John’s is the cathedra of the Bishop of Rome, the official eccelesiastical seat of the Bishop of Rome, the Pope, and not St. Peter’s in the Vatican. Contrary to earlier tradition that Pilate’s residence was in the Antonia, it is more likely that the Roman governor would have taken residence in the palace of Herod the Great on the west side of the city. This site is now located by the Citadel/Tower of David Museum, by the Afar Gate. The reasoning is that according to Jewish philosopher Philo in his “Embassy to Gaius” Pilate hung a set of golden shields “in Herod’s palace in the holy city” and further identified it as “the house of the governors.” Even Josephus tells us that the Roman governors occasionally stayed in the palace of Herod — when he was in Jerusalem for administrative duties, like Passover, rather than his home in Caesarea Maritima, some 60 miles away on the coast. I note that in my article referring to “Pilate’s headquarters” is ambiguous. I should have said “residence” to disambiguate the location. I have now corrected that. Can I just say what a relief to find a person that genuinely knows what they are talking about over the internet.